As an OT, my preference with Geoboards is the actual pegged board and rubber bands requiring haptic, graded fine motor control and bilateral skills along with visual perceptual abilities provided the possibilities of multiple layers of intervention. Use of an electronic Geoboard, however also has its advantages for learning mathematic principles or when just working on visual perceptual concepts. Presenting the Geoboard as an alternative to the real board certainly can be done easily when physical materials aren’t present or the electronic app is a motivator for engagement. 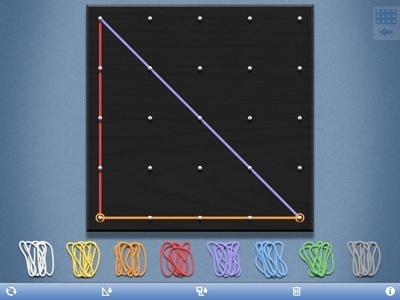 Try Geoboard app out and share how you might use it with your students. This entry was posted in App Reviews, Apps for OT's, Math, Visual Perception and tagged Geoboard, math, Visual Perception. Bookmark the permalink. This might be great to compliment the actual Geoboard….see if a student can copy the design from one to the other. I love all the apps you share! Great idea. When using the Geoboard, one of the steps was to have it near by to copy then copy across a plane. You could definely do that with the app. If your hard copy geoboard matched the number of pegs, you could create boards, do a screen shot then have students copy them on their board. Kate, Great idea! A mix of manual and electronic is so appropriate!